‘Points of View’ was produced at Pebble Mill for many years. The programme gave viewers the right to reply about what they loved or hated about BBC programmes. It tended to be recorded on location at a hotel near presenter Terry Wogan’s home a couple of days before transmission, and then edited either in London, or at Pebble Mill. Viewers wrote letters or emails in with their complaints or congratulations. The ones chosen by the production team were usually voiced by BBC members of staff. Clips of the programme they were talking about also had to be sourced and edited in to the 15 minute show, which usually went out on a Sunday afternoon. The photo was taken during the recording of the Points of ViewChristmas edition in the mid 2000s. The photo features (left to right), Ian Thomas (director), can’t see next two properly, Belinda Essex (researcher), Kate Hillman (A.P. 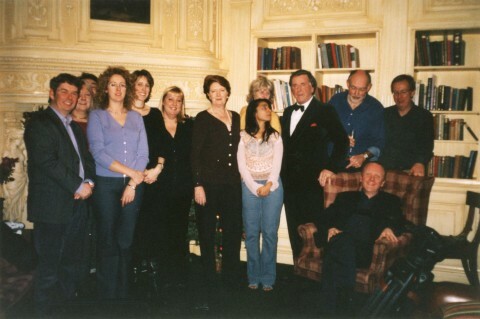 ), Sue Watson (producer), Helen Wogan (Terry’s wife), then Bina Mistry (researcher), with Gail Herbert (P.A.) behind, then Terry, and Nick Patten (Exec producer) seated, the camera crew is behind him. ‘Points of View’ is still produced by BBC Birmingham, although Terry Wogan handed over the presentation of the show to Jeremy Vine in April 2008. Thanks to Nick Patten and Gail Herbert for additional information.